Subject: Collective OP1 - dry run using Borg Sphere + Cube vs. Dom. Cruiser, Soong, and Hideki Fighters. My wife was getting ready to take the kids out for a barn dance at a friends house this evening. My youngest son (8) was restless waiting for the big event so I suggested we go down into the man cave and do some manly playing with plastic toy ships. I thought, just for fun, we could play through the Collective OP 1 scenario. So we got all crafty and made a 5" proxy cube, then picked out our ships. I liked that because I didn't want to look for, or have to put away, too many cards, so we got him set up pretty quick. We put our nice 3D Cube in the exact middle of the map, and lined up our ships. We lined up on the same side of the cube (my right, his left), as close to the edge as possible, and both of us up on the line of scrimmage - his Cube nearest the edge, and his sphere a half in on the other side. I had my Soong a pinky nail's width from the edge, and the fighers behind it about a half an inch. The Cruiser was up on the line of scrimmage to the left of the Soong. Then my wife called for my son, it was time for him to go. He looked at the game, and at my wife, and back at the game, and asked me if I could play for him. So I said I would. He wanted me to take some pictures too, so I did. He likes them spiced up with special effects, so I am going to include them thus. I set all the dials, reasoning that neither one of us would want to be in the middle along the edge if the Cube moved in on us, but then again, neither of us wanted to be hugging the starting line if the Cube moved toward us, and away from our opponent. I reasoned then that we were both going to shoot for the middle and hope the cube chose to move towards one starting area or the other. His sphere moved first, going forward four and taking a resistance token. My Soong went next leaping 5 forward, taking the free evade (named ship ability), and a resistance token. The fighters moved up next, straight four, and took a resistance token, followed by Gul Dukat on my Cruiser came up last for my team, straight four also. The cruiser also took a resistance token, and because of Gul Dukat, a battle stations token as well. I noticed that the cruiser was painfully closer to the sphere than my other two ships, such that I counted myself a fool for not having placed the fighters there. Finally I moved his cube up four, and boy, with that big base, it sure covered ground. It was close enough to Target Lock, but took the Resistance Token instead, using the Drone for re-rolls instead. It was close enough to fire on either my cruiser, or the Soong. I rolled randomly to see which ship my son's cube would choose, and it chose the Soong. So it rolled 6 dice, and managed only a single crit, then spent a drone token to get two more hits. The Soong had an evade, and managed to roll an evade with its single agility point, so one of its five shields was spent absorbing the crit. 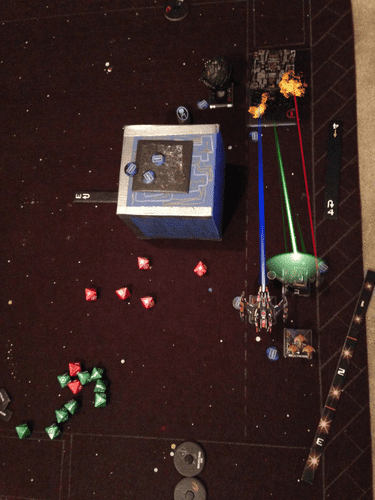 The Cruiser and Song returned fire, the Soong spending a drone token for re-rolls managed 5 hits, which the Cube was not able to evade with its single (poorly rolled) defense dice. The Cruiser also managed, with Battle Stations, to pull down another four hits and a critical, taking down the Cube's shields, and drilling into her hull. The critical gave another damage point, and was flipped. I used the four black tokens (echo, echo, echo, actual) I had from another scenario to randomly determine the cubes directions, and it could to North, towards, my son's starting line, east, where most of our ships were fighting, or South, towards my starting line. I was hoping for North, but pulled east. In a single swoop His Borg Drone from the Cube was gone, as was my Dukat (Zee goggles resistance tokens zay do nothzing!) He managed to roll a life saving crit for his 7 of 9 on the sphere. That annoyed me. So though the cube is shown moved already, and the round of battle had already been fought by that time, I added the special effects in the photo regardless. The Cube hadn't bumped anyone, but it sure was in the way now. Now that the sphere and the cruiser were without captains, Dukat's, the cruiser would be moving first. I moved him straight another two, putting him just past the center line. With no free action, there was no good reason to take a token, so he took a target lock on the sphere instead. His sphere, tucked itself behind the cube to get out of my arcs, but the Cruiser could still make him, but being up against the big cube, it opted to take a resistance token just in case. The Tactical Cube hedged it's bets and would have moved two forward, but bumped the Soong with its big base. No actions. The fighters attempted to bank into the sphere, but bumped the cruiser. 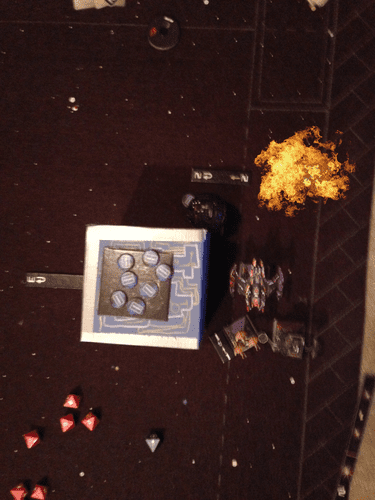 No actions, but that gave both the Soong and the fighters sights on the cube, and my ships got to fire first. The Soong rolled well, having 7 dice (one for range), but spent a token to re-roll three dice, to get four hits and three crits. The first crit was the one where the next time you fire you do no damage. The following one was an additional damage, and the final one was not being able to use the Captain's text - which was moot since there was no captain. The Fighters, still with an Attack of 6, finished off the Cube with four unanswered hits. I didn't put the explosion in the right spot (it should be directly in front of the Soong, but let's pretend the impact sent the debris and explosions at least that far. The cruiser bit into the Sphere, with six dice, and managing to take out the remaining shields. 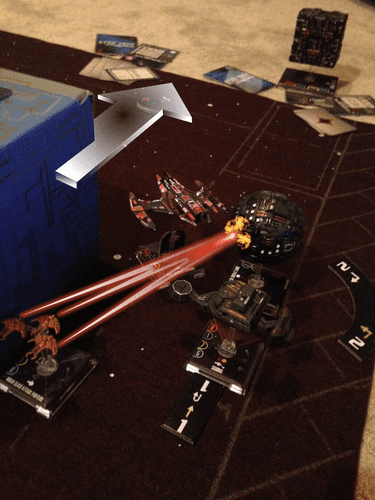 Then the big Borg cube attacked, rolling 9 dice (thanks to range) against the Dominion Cruiser which lost all but one shield as a result of this, and a pretty sweet evade roll. It attacked the fighters also, stripping them down one token. The Cube didn't attack any other ship, but assimilated seven of nine off the Sphere. The Cube had moved North just before attacking, (see the big white arrow in the third picture) and bumped into the Sphere which lost a shield in stopping the Borg ship in its tracks (you can see how close it is to the sphere in the above picture). In the final round (hint, my son loses), my son's sphere moved east to try and out flank my ships, hoping to move behind them as they either flew past or turned into the board. Incredibly it only missed sailing off the board by a hair's width. My ships did not move as anticipated however. The cruiser turned left into where the Sphere had been, but bumped into the side of the Big Cube. The fighters tried to right themselves, but scraped up along the side of the big cube also, only the Soong moved without bumping, an inch forward, to target lock the sphere. The sphere would go last, and two of my three ships would be shooting. The fighters shot first, with only five dice but managed two hits to the hull. The Soong fired next, seven dice, with a Target Lock, pulled in a mix of hits and crits to finish off the sphere. Game over. If you are playing with limited or no upgrades, and are using the fighter resource for that extra ship? Pay attention to where you put the fighters, they can save your captain if you play them right. Also, expect the cube to be on you like button on corn. If your fleet is all bunched in one place, that could be bad. Remember the cube must move three. That means that if you line up to the left or right of the cube, within the width of the "3" maneuver template, you can go straight if the cube goes left, right, forward or back. That might be handy. Lining up against the wall leaves you no place to run. If I try this again, I will try putting my ships in that sweet spot. The phasers, shields, and explosion effects are awesome, Dan. You'll have to teach me how to do that! Very sorry that I'm going to miss the Collective OP1. Nothing could be easier, once you learn to use the gimp. I would be very interested by a link to some tutorials for theses phasers, shields and explosions gimp effects ! It's hard to piece together now that I have done this sort of thing for so long, to remember exactly where I learned to do it. The gimp has tons of tutorials on line for just about every effect you could imagine. You need to learn how to work with layers, transparency, and then learn how to make a lightsaber effect. Once you get lightsabers, this kind of stuff is second nature - and there are a LOT of light saber tutorials out there.